Sea Containers Ltd. was a Bermuda-registered company which operated two main business areas: passenger transport and container leasing. James Sherwood founded Sea Containers in 1965. Over 40 years, Sherwood expanded Sea Containers from a supplier of leased cargo containers, into various shipping companies, as well as expanding the company into luxury hotels and railway trains, including the world famous Venice-Simplon Orient Express. 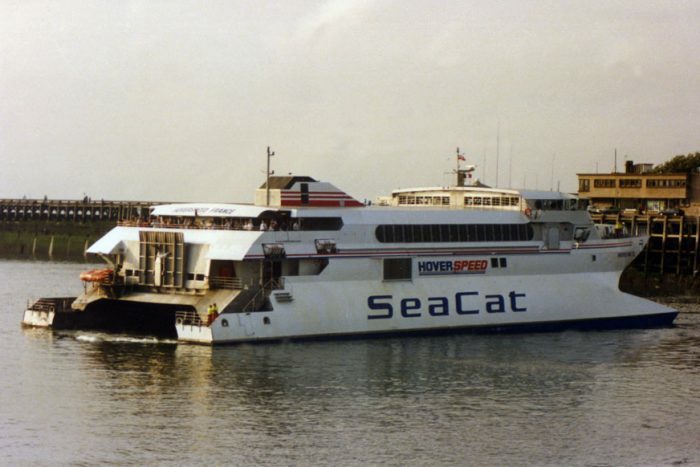 In July 1984 Sealink was acquired from the UK Government, being renamed Sealink British Ferries. In June 1986 Hoverspeed was acquired for £5 million. In 1990 following a hostile takeover bid Sea Containers sold Sealink British Ferries to Stena Line. Later the same year Sea Containers took delivery of the first of five new ‘Seacat’ ferries from the Tasmanian ship builder International Catamarans (Incat). These revolutionary vessels were the first car carrying catamarans and Sea Containers planned to radically change the ferry market. The first vessel was christened the Hoverspeed Great Britain and during her delivery voyage from Australia to the United Kingdom she challenged for the Hales Trophy (North Atlantic Blue Riband) for the fastest crossing of the Atlantic by a passenger vessel. She established a new speed record for a commercial vessel on her eastbound delivery voyage, completing the voyage in 3 days, 7 hours and 54 minutes. —- Under Construction. HSC Speedrunner III, ex Superseacat Three – Aluminium MDV 1200 mono-hull high speed craft built in 1999 by Fincantieri-Cant. Nav. Italian S.p.A., Riva Trigoso , Italy (Yard No. 6003) for Hoverspeed Ltd, (Seacontainers Ltd) Nassau, Bahamas as a car and passenger ferry. HSC Hellenic Highspeed, ex Viking, Superseacat Two – Aluminium MDV 1200 mono-hull high speed craft built in 1997 by Fincantieri-Cant. Nav. Italian S.p.A., Riva Trigoso , Italy (Yard No. 6000) for Hoverspeed Ltd, (Sea Containers Ltd) Nassau, Bahamas as a car and passenger ferry. MV San Guillermo, ex Marino, Picasso, Poker, Beaverdale,Wuppertal, Canaima – Steel twin screw motor vessel, built in 1977 by Rickmers Werft, Bremerhaven, (Yard No 375) for J.A. Reinecke & Company, Germany as a passenger and commercial vehicle ferry. HSC Naxos Jet, ex Cyclades Express, Al Huda I, Seacat Scotland, Q Ship Express, Seacat Scotland – Aluminium 74 Metre Wave Piercing Catamaran built in 1992 by Incat (International Catamarans) Australia Pty. Ltd., Hobart, Australia (Yard No. 028) for Hoverspeed Ltd, Nassau, Bahamas as a car and passenger ferry. HSC Master Jet, ex Snaefell, Sea Express I, Seacat Isle of Man, Color Seacat Norge, Seacat Isle of Man, Seacat Boulogne, Sardegna Express, Hoverspeed France – Aluminium catamaran built in 1991 by Incat (International Catamarans) Australia Pty. Ltd., Hobart, Australia (Yard No. 026) for Hoverspeed Ltd, Nassau, Bahamas as a car and passenger ferry. HSC Sea Speed Jet, ex Seacat France, Croazia Jet, Atlantic II, Seacat Calais, Seacat Tasmania, Emeraude France, Superfast Cat – Aluminium 74 Metre Wave Piercing Catamaran built in 1990 by Incat (International Catamarans) Australia Pty. Ltd., Hobart, Australia (Yard No. 023) for Hoverspeed Ltd, Nassau, Bahamas as a car and passenger ferry. HSC High Speed Jet, ex Cosmos Jet, Sea Runner, Speedrunner 1, Emeraude GB, Hoverspeed Great Britain, Christopher Columbus – Aluminium catamaran built in 1990 by Incat (International Catamarans) Australia Pty. Ltd., Hobart, Australia (Yard No. 025) for Hoverspeed Ltd, Nassau, Bahamas as a car and passenger ferry. Launched January 28th 1990. HSC Atlantic Express, ex Golden Blaze, Pescara Jet, Zara Jet, Pescara Jet, Seacat Danmark, Seacatamaran Danmark, Hoverspeed Boulogne, Hoverspeed Belgium – Aluminium catamaran built in 1991 by Incat (International Catamarans) Australia Pty. Ltd., Hobart, Australia (Yard No. 027) for Hoverspeed Ltd, (Sea Containers Ltd) Nassau, Bahamas as a car and passenger ferry. Launched October 29th 1991.